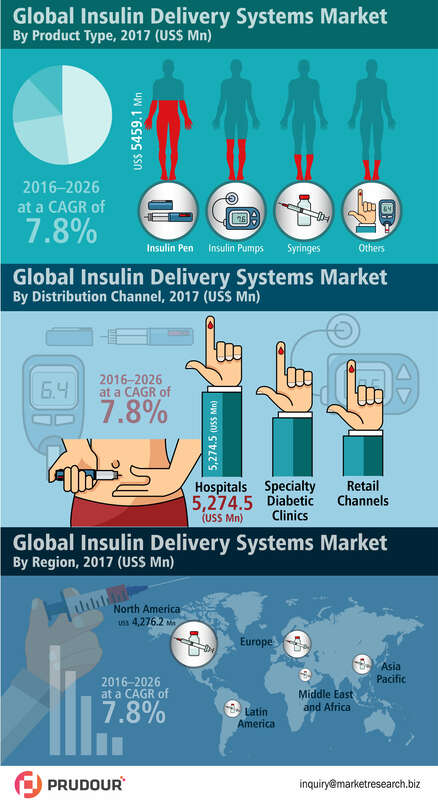 According to global insulin delivery systems market infographics published on MarketResearch.biz, over 8.0% CAGR by Product. By product: The insulin pen segment accounted for highest revenue share contribution as compared to that of the insulin pump, insulin syringe, and others. The insulin pump segment is expected to register a CAGR of over 8.0% between 2017 and 2026. By distribution channel: The hospitals segment is estimated to register highest CAGR of 7.8% as compared to that of the other end user segments. Also, it is projected to account for a dominant revenue share in the global insulin delivery systems market over the forecast period. By region: The market in North America accounted for highest revenue share in the global insulin delivery systems market in 2016, and is expected to register a CAGR of over 7.0% between 2017 and 2026.